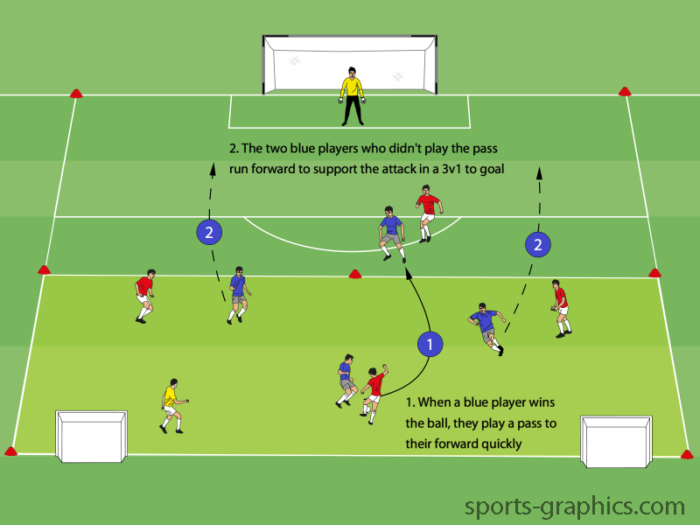 Win the ball to counter is a fun and competitive drill to help players go forward quickly as soon as they win the ball. Create a field with a large goal on one side and two mini goals on the opposite side. Divide the field in half and create two even teams. This drill works best with team sizes of four to six players. In addition, assign one player to be a neutral player to play all time offense. Each team selects one player to start the game on the half of the field with the large goal. All other players begin on the half with the mini goals. The game starts by playing a ball in to one of the teams who try to complete six passes before scoring on the mini goals. If the defending team wins the ball, they look to play a pass to their forward on the opposite half of the field quickly. With this in mind, when the defending team wins the ball they can send two additional players to the opposite side. This creates a 3v1 situation attacking the large goal. This drill encourages one team to keep possession of the ball while the other team is trying to win it back and counter attack quickly. As soon as the defending team wins the ball, players should be motivated to go forward to help their team score. The faster a team is able to transition, the quicker they go from having a 1v1 situation to a 3v1 situation.